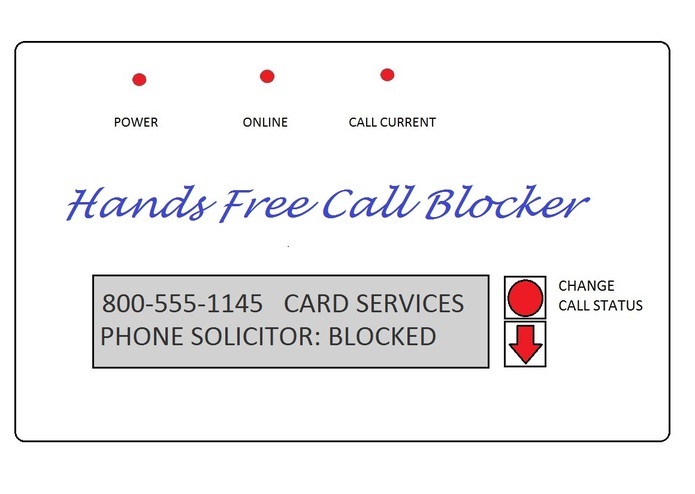 The Hands Free Call Blocker is a standalone device that connects between your phone jack and your phone. It uses a central blacklist database which is updated constantly to block calls that have been flagged as unwanted nuisance calls by other users. Each user sets up an account to subscribe to the database, in order to keep the list current. The device combines the techniques of blacklisting, whitelisting and call challenge in order to block unwanted calls while passing through all other calls. The database is constantly updated through crowd sourcing. When a few users flag a phone number as a nuisance caller, that number gets added to the blacklist, and within hours all other users of the device are shielded from that caller. During setup, users will be able to choose what type of calls they wish blocked and which type of calls will be allowed. Each user has final control over the phone calls they wish to receive. After initial setup most calls will be blocked for users automatically. There will be no need to manually add phone numbers to the whitelist or blacklist. Any user with caller ID and an internet connection should be able to use this device. While the illustration shows a hardware device to protect a landline phone, the same technology would be able to work on a smart phone and even a standard cell phone with support from the carrier.